BASS WEEK: Few bass players have appeared on as many hit records as James Jamerson. Having cut his teeth performing nightly on the Detroit club scene, and working as a session bassist in local studios, James was enlisted in 1959 by Berry Gordy as the go-to groove smith for his Motown label. Over the next 23 years, Jamerson would play on hundreds of songs, including My Girl, I Heard It Through The Grapevine and Marvin Gaye’s What’s Going On to name a few. 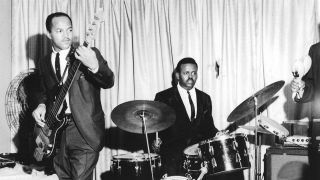 Previous to his Motown era, Jamerson had been an accomplished upright bassist, and while he favoured Fender Precision electric basses, namely his ’62 ‘Funk Machine’, he made a few tweaks to replicate the sound and feel of a double bass. The Funk Machine was strung with flatwound strings, and included a string mute under the bridge cover. The guitar’s action was set high to allow for his heavy picking technique, resulting overall in the characteristic round, punchy sound. The Funk Machine was stolen days before Jamerson’s death in 1983, and is yet to be found. Jamerson was only 47 when he died, but his baselines and influence on the instrument live on. Okay, this has a Jazz Bass pickup too, but the quality of Squier’s VM range will get you far closer than you deserve for £270, and it comes in the right Three-Colour ’Burst finish! Groove is in the Hartke – this 75-watt brute keeps it simple, with easy-to-use controls, headphone output, and an aux-in so you can jam with the examples in this very mag! Buried in the Funk Machine’s bridge cover were rubber mutes that dampened the string to give a fatter sound and less sustain. Put any old bit of dense sponge or foam under your strings by the bridge to replicate the effect! It’s only a year out from the specs of Jamerson’s Funk Machine, and with classic P-Bass appointments including bridge and pickup covers, plus thumb rest, you’ll be grooving through My Girl immediately. Jamerson took the Fender strings off his ’62 in favour of La Bella flatwounds. They’ll increase your ‘thud’, banish finger noise, and at £40 a pop, it’s no wonder he didn’t change ’em often. You could splurge the best part of £3,000 on a reissue of Jamerson’s Ampeg B-15. Instead, we’d suggest checking out this 15-inch-loaded solid-state beast from the same brand. Spend the change on structural repairs. For an authentic Jamerson tone, aim for a warm sound with lots of low-end punch, but minimal sustain. James used flatwound strings, which he preferred ‘worn in’ (he rarely changed them) and furthered deadened using the Precision’s bridge mute. Typically, he’d keep the bass control on his amp high with treble set around midway driving the valves hard for a little extra drive. Compression was added in the studio. Jamerson’s incredible career spanned iconic artists such as Marvin Gaye, The Temptations, Stevie Wonder and The Four Tops during the '60s and '70s. He originally moved from the upright bass to the electric and in so doing, created his signature pick hand index finger ‘hook’ technique to rake across the strings. He was also renowned for his inventive chromatic lines, syncopation and inversions at a time when most soul and blues bass playing relied heavily upon root notes and 5th intervals. Much of James’ playing included rhythmic movement ‘in between’ the notes – a technique often referred to as ghost notes. These are usually marked in notation with a bracket and indicate a slight rhythmic pick up that is played a lot softer than normal notes (often using open strings). This takes lots of practice to perfect, but can really lift your playing and give a great funky feel. This riff is based around E major pentatonic notes (root, 5th and 6th) and uses syncopation to create movement. Take particular care with the dotted eighth to 16th note rhythms in bars 1 and 2: try to place less emphasis on the 16th note as it is played as weaker beat leading into a strong one. Building on the idea of dotted notes and syncopation, the introduction of chromatic notes in bars 2 and 4 provides the challenge here (especially when playing fingerstyle) so practise slowly to perfect this typical Jamerson style groove. Notice how a b7th is introduced to outline a dominant 7th sound (but with no 3rd). Use a Jamerson-style index finger ‘rake’ for the arpeggio on beat four in bars 2 and 3. Guitarists (especially fingerpickers) tend to want to use two or three fingers, but the idea is to use just one to pick three consecutive strings, thus making the transition smoother. Finally we introduce the ghost note – a staple technique for any bassist, especially funksters. Ghost notes should sound like they’re barely there; more of a rhythmic stepping-stone to get to the next strong beat than a note. Try and sing/vocalise the rhythm before playing it on the bass.